Los Angeles, CA – August 25, 2016 – Thought Development Corp., developer of the leading workflow management system for the media promotions industry, announced that GSN, the innovative leader in game shows and competitive entertainment, selected ON-AIR Pro™ to track orders and production of on-air and off-air content including secondary events. Los Angeles, CA – January 6, 2016 – Thought Development Corp., developer of the leading workflow management system for Broadcast and Cable media promotions, announced that Spike, a Viacom channel, has chosen to install ON-AIR Pro™ to support the organization’s media production processes. Los Angeles, CA – October 20, 2015 – Thought Development Corp., developer of the leading workflow management system for the media promotions industry, announced today that ON-AIR Pro™ is now live at FOX Sports. Los Angeles, CA – August 20, 2015 – Thought Development Corp., developer of the leading workflow management system for the media promotions industry, announced that Fox Broadcasting Company (FOX) is deploying ON-AIR Pro™ to streamline workflow across the network. 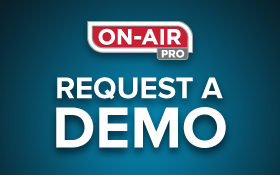 The system is being installed with the complete suite of ON-AIR Pro™ plugins and will integrate with a number of mission critical FOX systems, such as program scheduling and traffic and delivery.